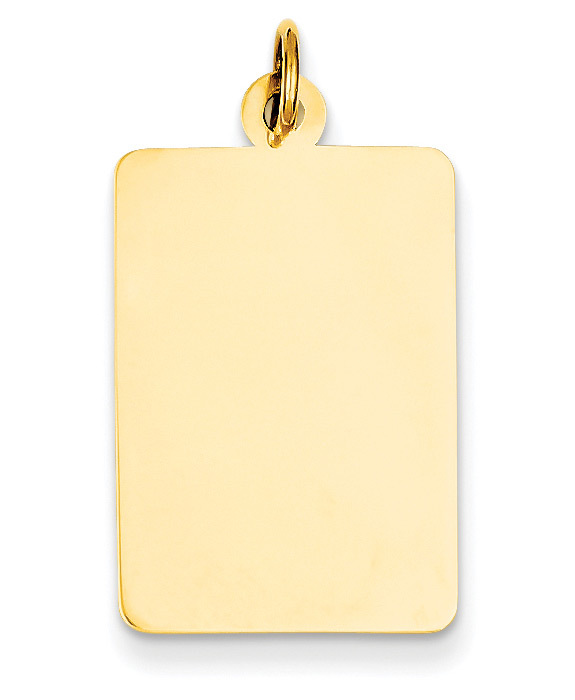 14K solid gold engravable rectangular disc charm pendant necklace with rounded corners, made in the U.S.A.
Engraving is optional, but both front and back can be engraved. Will fit on multiple lines as needed. Our engravers will use discretion to make your engraving fit - or you can email us with the exact wording you would like per line (up to 4 lines of text on front and back). The disc measures approx. 7/8" (or 1 1/16" tall with hoop/bale) x over 9/16" wide (in between 9/16" and 5/8"). Hoop/bale measures 4mm x 1mm in size. Add a matching 14k gold box chain in 18" or 20" (optional) or choose from our variety of gold chains. Normally ships within 1 business day. If engraved, please allow an additional 2-4 business days. We guarantee our Engravable Rectangular Disc Charm Pendant, 14K Gold to be high quality, authentic jewelry, as described above.